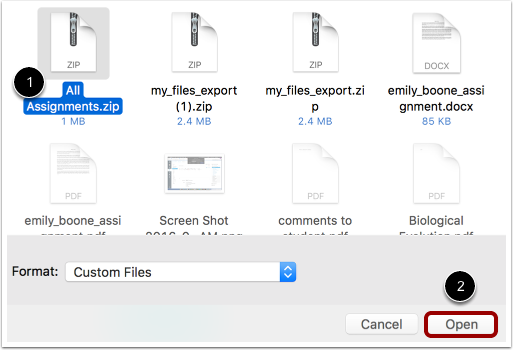 You can import ZIP files to Canvas through Files or Course Settings. 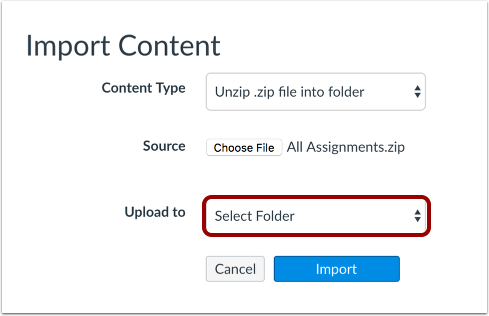 Through Course Settings, you must upload the ZIP file to an existing folder in Files. You cannot create new folders through the Course Import Tool. ZIP files containing internal folder structure retain that folder structure upon upload. If you do not know how to create a ZIP file, please consult your computer operating system's user guide. 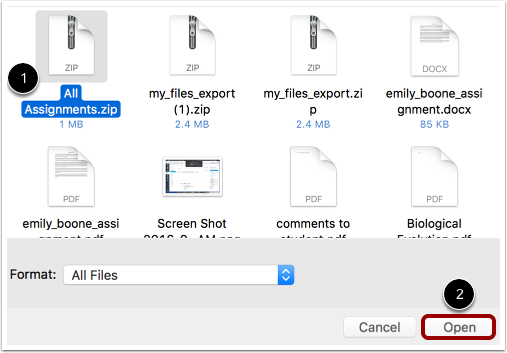 You can import a ZIP file directly in Files. In Course Navigation, click the Files link. Click the title of the file you want to import  and click the Open button . If you want to expand all the contents of the ZIP file, click the Expand It button . 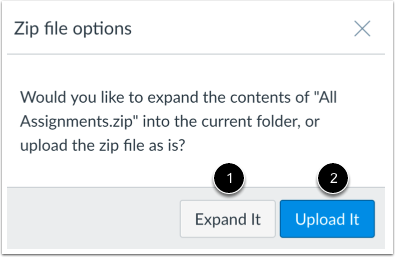 If you want to upload the ZIP file intact, click the Upload It button . You can track the progression of the upload by monitoring the progress bar. Your files will be uploaded to Files in Canvas. 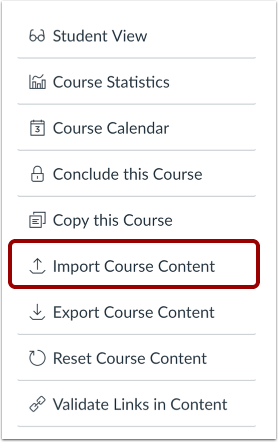 You can also import files through the Course Import Tool in Course Settings. 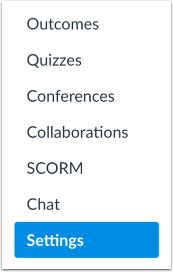 In Course Navigation, click the Settings link. 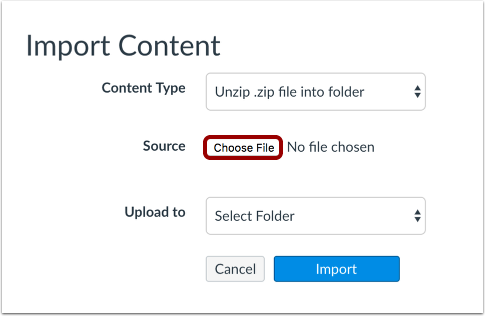 In the Content Type drop-down menu, select the Unzip .zip file into folder option. 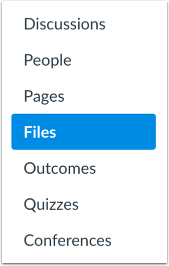 In the Upload to drop-down menu, select the folder where you want to upload your files. Note: You must upload the file to an existing folder. You cannot create new folders through this feature. The Current Jobs menu displays the status of your import. Running reports display a menu bar with the time remaining to generate the report. Import statuses include queued, running, completed, and failed. Open Files and view your imported files. Previous Topic:How do I preview a file as an instructor? Next Topic:How do I bulk upload files to a course? 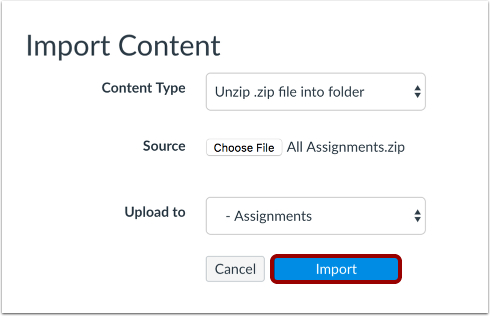 Table of Contents > Files > How do I upload ZIP files as an instructor?